Can I Work Internationally with a Nursing Degree? As you contemplate either becoming a nurse or exploring the next steps in your nursing career, you may be wondering if you can work internationally with a nursing degree. Since nursing is a universal need, you’ll find that your nursing degree can open doors abroad as well as at home. The types of international jobs you may qualify for will depend on your interests and training. Different countries have different requirements for their nursing jobs, so you will also need to look into those carefully. The first step toward working internationally is to become a registered nurse (RN). You can become an RN after obtaining a diploma or degree, either an associate’s or a bachelor’s degree in nursing, and then passing the national nursing exam, the NCLEX. Once you have become an RN, you will be able to look for nursing positions both here in the United States and elsewhere. Some international jobs, depending on where you go and what you end up doing, may require further education and training. If a job requires specialization in a certain field, you will probably be well served by getting your master’s degree in nursing and becoming an advanced practice RN. Just some of the types of nursing work you might find internationally include jobs in disaster response, work as a nurse midwife, critical care management, public health advising or work as a nursing instructor. 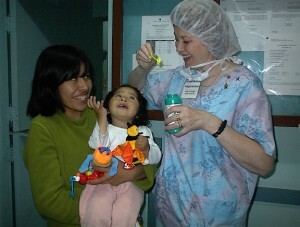 You can learn more about these and other kinds of international nursing work from the International Council of Nurses. They have a number of networks to assist those who are interested in learning more about opportunities of a specific kind. Some of these include the Rural and Remote Nursing Network, the Disaster Response Network and the Nurse Practitioner/Advanced Practice Network. These and others of their group can give you a good idea of the types of jobs available for nurses overseas as well as the resources available to assist you in doing these jobs. You can also learn about various types of nursing jobs, some of them international, through the Centers for Disease Control (CDC). CDC nurses work in a variety of roles that help to improve community health and education. Many of the jobs you will find there and at various organizations such as the American Red Cross and Doctors Without Borders involve work in public health. Sometimes you will be involved in caring directly for patients, and at other times, you may be training and working with indigenous health care providers. For more information on becoming a public health nurse, please see: How Do I Become a Public Health Nurse? If you think you are interested in working as a nurse overseas, it can be a good idea to talk with other professionals who have walked the path before you. They can help you to understand some of the rewards and challenges involved in this career choice. While your specific nursing skills will help you, other skills will likely be of benefit too, such as the appropriate language skills. The decision to work internationally with a nursing degree can be both demanding and exciting, so you will want to spend time exploring the various possibilities that are open to you.